The blog post about working from home got me thinking and after seeing the Act on CO2 ad on the TV I came up with today’s post. You can really help to reduce your energy consumption and carbon footprint by taking more journeys on foot rather than by car. There are lots of advantages of walking to work or walking to the shops. However, they may not be so tempting now that the weather has taken a turn for the worse! Health and Exercise – walking is a great way of improving your general fitness. Rather than sit motionless behind the wheel, get a sweat on and burn off some calories! Stress – does heavy traffic and traffic jams make you feel frustrated? Leave the car at home and relax on your way. It may take longer to get there but the journey will be much more enjoyable. Talk and Walk – unlike driving, you can use your mobile when you are walking. Catch up with your mates or give your mum a call – don’t use a bluetooth headset though because everyone you walk past will laugh at you. Music – get your ipod on and rinse out some of your favourite tunes or podcasts – just make sure you watch out for cars when you cross the road! Save money – cars are pretty expensive beasts! After the money you have spend on the car, insurance and road tax – each time you use it you will be spending cash on petrol and car parking too. So.. what are you waiting for? Give your car the day off and get walking! I’ve been poorly over the last few days and as a result I have fallen behind a little on my daily blog posts. 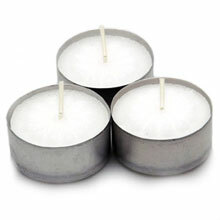 For today’s energy saving tip I would like to highlight the enormous benefits of using candles. I was skeptical at first of just how effective they are but after a little research and some number crunching I am now a candle convert. We’ve got a big selection of candles in our flat.. tea lights, tapered candles, pillar candles and scented aromatherapy candles. When we sit at the table for our dinner Claire insists that we have tea lights in the candle holder. This turns each meal into a romantic candlelit dinner for two (or more if we have visitors!). It’s surprising just how much light the candles give off, and even more surprising how long they last for. Admittedly these are based on very rough estimates, but I’m sure you get the idea! If you work in an office ask yourself, do I need to go into work everyday in order to do what is expected of me in my job? If you don’t, working from home could really be something to look into. A recent study in the US found that the average person spends around 51 minutes commuting to work – that totals up to a whopping 9 days a year! Unless you walk or ride a bike, this commute will be probably be taken by car or public transport which means that your carbon footprint will increase as a result! I currently drive from Nottingham to Leicester, which is about 2 hours per day. Does working from home contribute to global warming? The consultants WSP Environmental found that home workers produced a third more CO2 emissions compared to office based workers. When working in the office, energy use such as heating and lighting is more efficient when several people share the space – 10 people can share a heated room, rather than heat 10 different rooms in each employees homes. 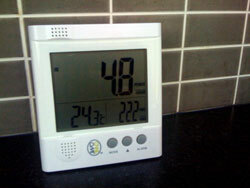 If you do work from home, it is still important to be aware of your energy use. Following the some of the advice in these previous posts will help reduce your energy consumption. If you are working in the same room all day, do you need to heat the whole house? If you are making a drink, do you need to fill the kettle up with that much water? The decision to work from home must be taken in context – in some cases it is more beneficial, whereas in some cases there can be some problematic areas. Suppose there is no harm in asking! We all like a good cup of tea, don’t we? It’s a great British tradition after all. 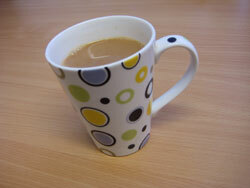 Recent government figures claim that about 229 million cups of tea are consumed in the UK every day. So, after a bit of basic maths, we can see that 9.5 million cups are made and enjoyed every hour of every day! That’s a lot of tea, and a lot of energy being used to make it. The most accurate estimations suggest that, on average, every kettle is filled with twice as much water than it needs and is boiled 90 seconds longer that necessary. So it seems we are all using more energy than we need to make our favourite break-time beverage. I know a lot of you may think this seems a tad trivial – surely there’s bigger climate change fish to fry than this!? – but The Department of Environment, Food and Rural Affairs (DEFRA) reckon that if everyone used just the amount of water they needed every time they boiled the kettle “we could save enough electricity to run practically all the street lighting in the U.K.” When you look it at like that it doesn’t seem too trivial really, does it? Also, by only filling your kettle with the water you need you will see a sizeable reduction in household bills, as the Department of Environment, Transport and the Regions (DETR) say that overfilling kettles amounts to wasting enough electricity to light your house for a day. So by just being a bit more environmentally conscious next time you make a brew you could help save the planet and save money at the same time! Guest post written by Luke Glassford from Anicca Solutions. Energy Saving Tip 10: Turn off your TV at night! Just like every other nation, Britain loves TV! Today the box in the corner is a focal point, the bigger the better in some homes. The TV provides us with a lots of entertainment, very few are now just used for terrestrial channel watching. Most now have digital, Freeview or Sky for example. Films on DVD are easy to watch and you never have to miss your favorite soap with sky+. When your not watching TV on your TV you can play games or even surf the web on it! With all of this, it can’t come as any surprise then that the TV is one of the biggest energy burners in the living room. You sat in front of it certainly isn’t a contender! Don't press standby - turn is off! On average a traditional cathode ray tube (CRT) television set uses 100 watts of power when in use and about two watts on standby. Newer LCD and plasma screens are higher users of energy, with the largest models consuming up to 400 watts when in use and about four watts on standby. TVs can also present a potential fire hazard. Many house fires are due to electrical faults from TVs being left on stand by. Obviously, TVs are electrical safety checked by the manufacturer but is it really worth the risk? 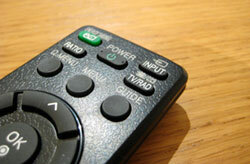 People simple pressing the off button on the remote, rather than the power off button on the TV is a real issue when it comes to saving energy and climate change. So much so that there is a chance the government is to outlaw standby switches on televisions and video and DVD players to cut the amount of electricity wasted in the home. Manufactures are making measures to address the problem. Some clever TVs do power off at the remote and there are some products on the market (one featured on Dragons Den) that can cut off the power at the plug. Consumers can now safely switch off most DVD players/recorders, hard disk recorders or video recorders purchased in recent years, according to the Energy Saving Trust. They should not need to retune the devices when they are switched back on or have to contend with the dreaded flashing clock as the machines usually retain their settings. However, manufacturers recommend that some satellite TV receivers be left in standby when not in use so they can receive updates. When you go to bed at night count how many little flashing lights or red dots you can see. Its surprising how many household appliances stay awake whilst you are asleep! With the electricity companies increasing their prices all the time I took the bull by the horns in my house to try and stabilise my electricity usage. I purchased the Owl Energy Monitor to try and help me out a little. It was really easy to connect up. Firstly I clipped the block around the red/brown thick cable before it went into my consumer unit. (Be careful when messing out in your electricity box as there are obviously high voltages.) Anyway, I put the batteries into both the sender (The bit next to your consumer unit) and the receiver (The display). I synced them together following the instruction supplied. I then needed to take a look at my latest electricity bill to find out how much I was paying for each kWh. It is shown on your bill – if you don’t have one the suppliers website will help out. I also changed the price to £ and off it went. I could have set an alarm when the unit goes above a set amount but I didn’t want to do that – I was too excited to see the reading! So I sat back and waited for the Owl to tell me how much I was coughing out for powering the stuff in my house…. 35.8p per hour was the first reading – WHAT, OH MY GOODNESS, I didn’t need to be a mathematical genius to work out 75.8p x 24 hours = £8.59 a day!!! So I rushed around the house turning everything off. OK it got it down to about 2.3p per hour but I was sitting there in the dark! It was fascinating to see just how expensive it was to run everyday electrical items like a tumble dryer, dish washer and Sky box. I could see straight away the money pouring out of my pockets to the electricity company! After a month or so I had really reduced my electricity consumption. Basically by only using high energy usage items when I really need too, if it’s sunny, put the washing on the line, turn the LCD TV off at the switch and not leave it in standby, that sort of thing. I am averaging at about 5.3 pence an hour as I write this blog and I have had a nice fat credit to my electricity bill. I paid for the unit in about 2 months and have already reduced the bill by about 40% – all because of the Owl. It sits on the kitchen work surface reminding me. Shall I tell you what made the biggest difference? The electric kettle! OK, it was a high tech fast boiling one but it didn’t half show on the Owl! So that went into the loft for storage and I purchased a gas powered kettle – ok it takes longer to boil but is SO much cheaper in the long run, now where is my cuppa tea…. Guest post written by Jonathan Cecil. Energy Saving Tip 8: Turn off your tap! When you brush your teeth in the morning and at night, do you leave the tap running or do you turn it off? If you do leave the tap on, hang your head in shame! This is something that’s really simple to change and can have a big effect on the amount of water used in your household – if you are on a water meter, it will also help to reduce your bills too. It is estimated that on average, a bathroom tap will flow at a rate between 5 to 7 litres a minute! If you don’t believe it, try putting the plug in while you brush your teeth and see how quickly the bowl fills up. If you start turning off your tap, you could save around 20 – 30 litres a day. A family of 4 could therefore save somewhere in the region of 80 -120 liters! If everyone in the UK were to turn off their taps while brushing their teeth, the water saving would be the equivalent of supplying 500,000 homes. 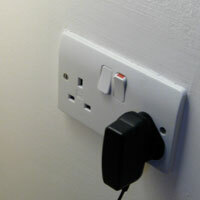 When you have finished charging up your mobile phone do you ever leave the power adaptor plugged in and switched on? If you don’t, give yourself a pat on the back! Turn off your mobile charger when it's not in use! When plugged in and switched on, mobile phone chargers normally draw the same amount of energy whether they are charging a phone or not. Do you leave your phone on charge overnight while you are sleeping? Most modern mobile devices will take around an hour to fully charge, so this will mean that while you are asleep your phone which will be fully charged is wasting energy and should really be switched off. If you need your phone charged up for the day, the best time to charge it is when you wake up in the morning. This means that when you leave for work, your phone will be charged! To speed up the time it takes to charge your phone you could switch it off. If you have a modern phone, turning off bluetooth and wifi will ensure that your battery lasts much longer between charges and will charge faster when plugged in. When buying new products for your home or workplace, does the energy efficiency of the appliance have an effect on your decision making process? It may be tempting to always opt for the product with the lowest ticket price, but in the long run a more expensive item which uses less energy could save you money in the long run. EU directives (92/75/CEE, 94/2/CE, 95/12/CE, 96/89/CE, 2003/66/CE, et alia) dictate that most electrical items, light bulbs and cars must display an EU Energy Label which displays the energy which is consumed by the item. These labels should be used as a guideline when purchasing products, the most energy efficient appliances will be rated in the green letters. Here’s the energysaving kettle I bought last year, it was on offer too! I noticed in my Google Analytics stats that I was getting traffic from people looking for advice on how to save energy over Christmas. During the holidays energy use can often increase, especially if you are hosting the family! Don’t leave your Christmas lights on all day, have them on at night when they can be seen properly. When your Christmas lights are on, compensate by turning down or turning off the main lights in the room. Use recycled wrapping paper – try not to use too much and make sure that it all goes in the recycling bin on Boxing day! Turn down your heating. The extra people in the house combined with the cooking will heat up the house more than normal anyway. Reduce the time needed to cook your turkey by removing the legs. If you always end up throwing left over meat away, think about buying a smaller bird. If you have a real Christmas tree, only buy one from sustainable suppliers and ensure that you either plant it in your garden or recycle it after the holiday period.